The Rainbow Falls in Hilo are a good place to visit early in the morning perhaps even before breakfast. This broad waterfall in the Wailuku river is conveniently located within Hilo town. It cascades over a lava cave that according to legends is home to the ancient Hawaiian goddess Hina, the goddess of the moon. The waterfall itself is a modest 80 ft high, which is not that high compared to the nearby, 422 ft, ‘Akaka falls. However, the Rainbow falls are more easily accessible and it is possible to see the falls from very close, compared to the ‘Akaka falls. Besides, a big selling point of these waterfalls are the many rainbows you can see in early morning. Depending on the amount of rainfall upstream in the preceding days the falls can be either roaring or they can be reduced to a trickle. We have included pictures of both scenarios on this page. In the Hawaiian language, the rainbow falls are called “rainbow [seen in] water”, or Waiānuenue. 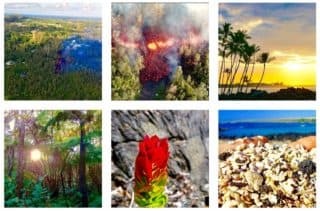 If you are interested in the meaning of Hawaiian place names you can find more information on them here. How big the rainbow falls are depends directly on how much water is falling in the watershed above on the Volcano. It had been raining for a few days before we took this picture (and still was, see the two people with umbrellas at the top left for scale). 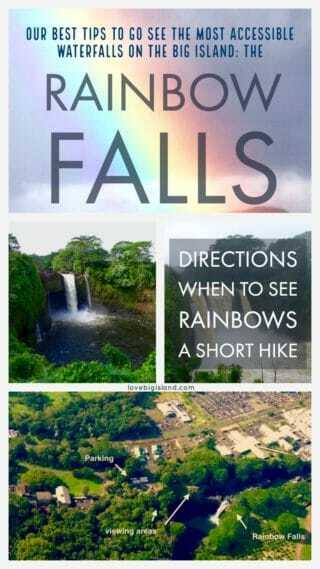 Why are the Rainbow falls called the Rainbow falls? You can only see a rainbows that is caused by sunlight when you are standing with your back towards the sun. This is because rainbows are caused by reflection, refraction and dispersion of light in water droplets (find out more about rainbows). The water droplets in this case don’t come from rain, but from all the small water droplets that surround the falling water! The viewing area for the rainbow falls is east of the falls. If you want to have the sun in your back while you look at the falls, you need to do so in the morning because the sun rises in the east. So, to see the best rainbows you should arrive early on a sunny morning. It is also best if there is a lot of water flowing (and falling!) in the waterfall, but even with little water you can still see rainbows. The short climb to the top of the rainbow falls is well worth the effort. As you climb up along the left shoulder of the falls (left, when facing the rainbow falls) you walk past lush vegetation and some immense banyan trees. After walking for a few minutes you will be rewarded with a new perspective on the falls. A short distance upstream of the rainbow falls you can also find the Pe’epe’e falls. 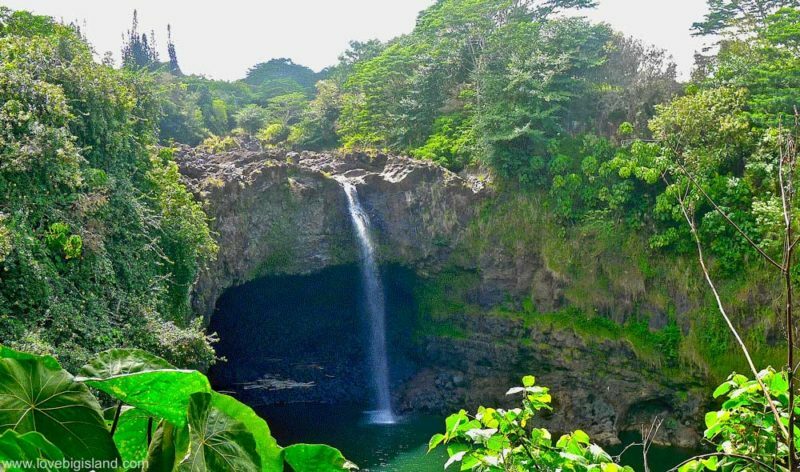 Both waterfalls belong to our list of 5 best Big Island waterfalls. 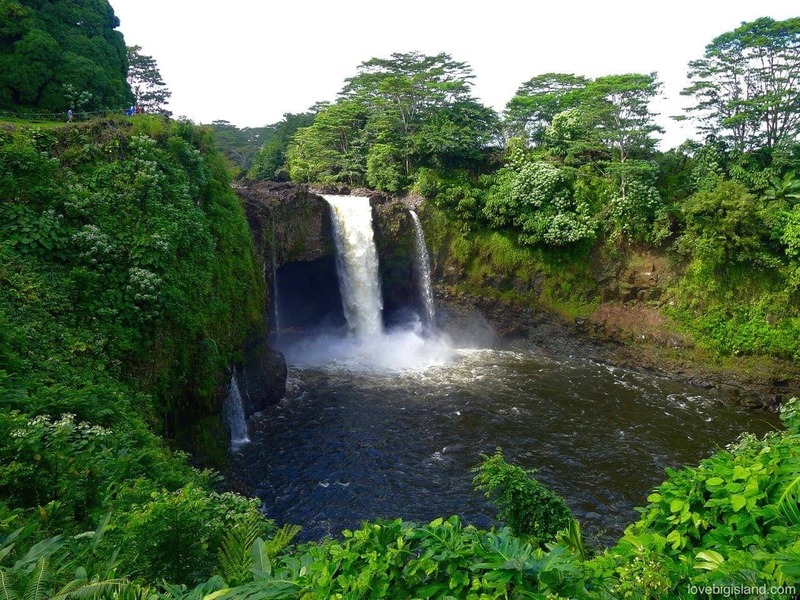 The Rainbow falls in Hilo on the Big Island of Hawaii are hidden on the edge of the city. If you come early, you can how they got their name: the rising sun creates many rainbows in the falling water. You can find the Rainbow Falls at the northwest border of Hilo, just off Rainbow Drive. To get to the falls, drive up Wainuenue Avenue, turn to the right on Rainbow Drive, and park in the parking lot on your right hand side. The rainbow falls are inside Hilo town and extremely easy to reach. Walk less then 100 ft to the first scenic overlook. 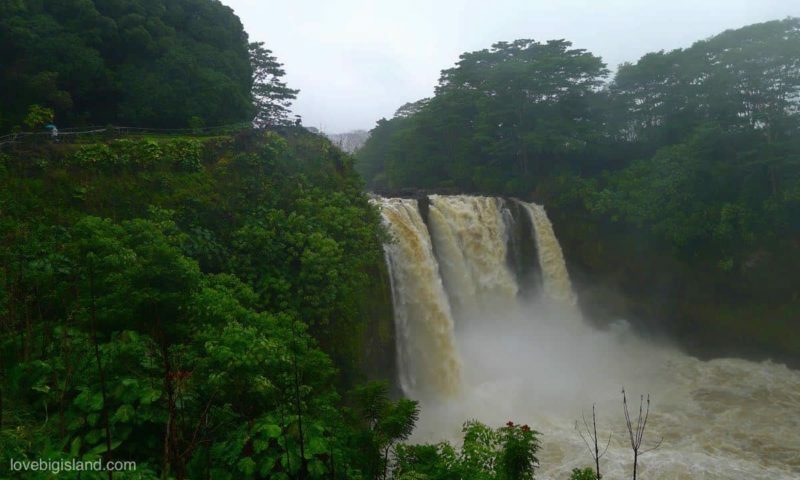 The Rainbow Falls are located at the northwest border of Hilo.